You may not need a heavy duty model like the one in the photo unless you are doing some serious “blending”, but if you enjoy whipping up a breakfast shake or adult cocktail, they are nice to have around. 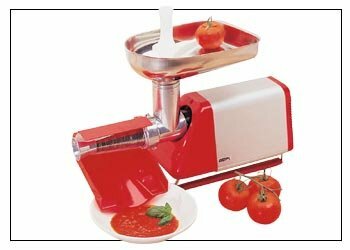 An essential tool for separating pulp from skin and seeds when making a basic tomato sauce or salsa! I purchased an old hand cranked tomato strainer from years ago. It worked great but you really needed an extra set of hands to keep the process going. Sort of like when you are making your own homemade pasta. This new electric tomato strainer makes the job a lot easier and a lot faster. Plus you can process a lot of tomatoes in an afternoon. Plus, it can be used for fruit or vegetables. Basically it eliminates the tedious job of separating the skins and seeds from the pulp and juices. This tool is incredibly helpful when you are preparing your baskets of summer tomatoes for a basic tomato sauce. But it is also fun to use to make soups, sauces or even homemade jams. This Spremy model has a stainless steel hopper, cast iron spiral and stands only 13 inches for easy storage. All you have to do is load the food into the hopper on top, turn on the moter and the spiral roter cranks the food through a strainer holding back the skin and the seeds but allowing the pulp and juices go down a wide “squirt guard.” The unwanted seeds and skin exit from a long funnel on the side. If you are into making your own homemade tomato sauce or babyfood, a tomato strainer will really make the job a lot easier. There are lots of sources for purchasing quality small kitchen appliances including blenders, toaster and mixers. I suggest you check out your local department stores and kitchen supply shops but if you’re looking for a wide selection of products and prices, you may want to check out Amazon.com where I buy many of my favorite pieces of cookware.